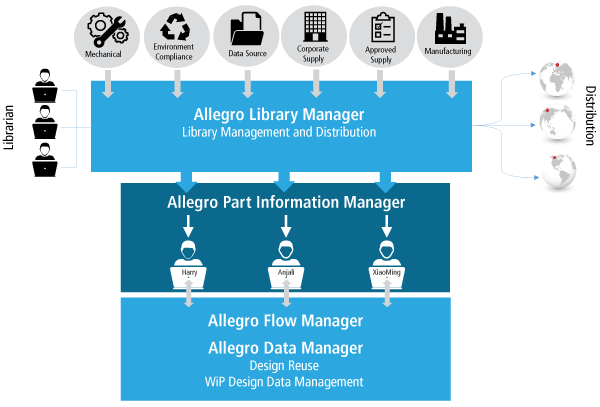 The Cadence® Allegro® EDM (Engineering Data Management) family of products combines library management, design data management, design process control, and design tool integration in a collaborative work environment. Valuable in workgroup environments, Allegro EDM significantly improves productivity while reducing costly mistakes that are often introduced due to a lack of a unified environment. Common access to component information and preferred parts libraries speeds component selection and eliminates errors due to flawed, obsolete, or non-preferred parts. Allegro EDM provides a uniform user interface that enables development of a company-defined design methodology. It ensures that all project members follow the same process, and reduces training and support costs. Incorporating design data management allows designers and design teams to work in parallel—with significant savings in the schedule—thanks to data vaulting and version control. Non-CAD users benefit from access to current design documents and view-and-mark-up technology that enable them to return comments directly to the design owners.